We asked you on Facebook the other night what type of recipes you wanted to see more of- and many of you wanted Toddler Friendly Dinners! So, today I’ve got one for you! 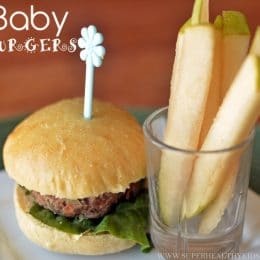 Baby Burgers! Plus, if you haven’t been over to our meal plan page, we update it every Saturday with new menu ideas! It’s small enough for little fingers to hold. The buns are homemade, to get them the perfect size! Most of the veggies are inside the patty, so they don’t slide off while the kids are trying to eat it! 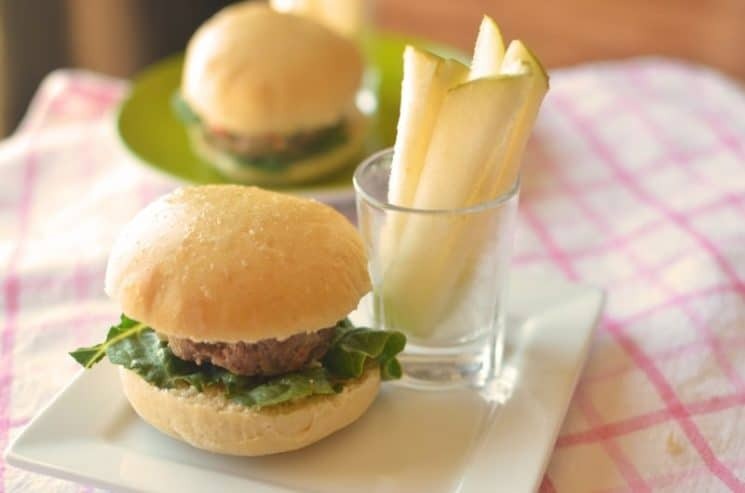 Plus, we served our burgers with sliced pears, and don’ they just look like fries (without all the work!) The kids loved the pears as much as they like fries! Now, I know this post will seem long and overwhelming, but I’m hoping it will help clarify the steps for you! So, here we go! 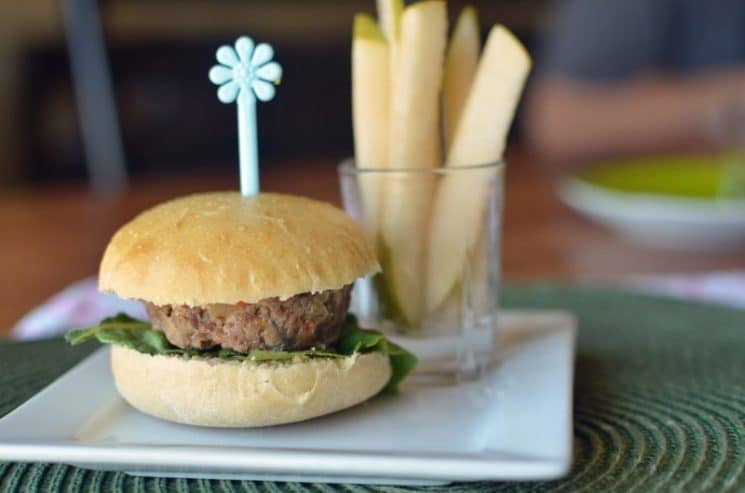 First: The mini burger buns! I first had to grind some whole wheat- My husband bought me a wheat grinder for Christmas! In a small saucepan I warmed 1 cup of milk, 1/4 cup sugar, 1/3 cup butter, and 1/2 tsp salt, just until the butter melted and no longer. 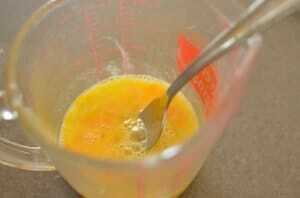 Then, I poured the liquid into the dry ingredients and mixed. Then, in a high powered mixer (like a kitchen Aid), I added 2 cups of whole wheat flour, 2 beaten eggs and kneaded for about 5 minutes. 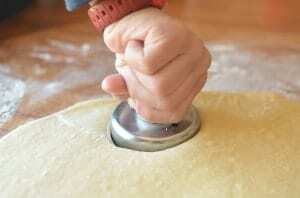 You can also knead by hand if you don’t have a mixer. I added about 1/2 cup more of flour to keep the dough from sticking to the sides (you may or may not need this). Then, I sprayed a large bowl with cooking spray, and dumped the dough into it, covered, and let rise for one hour. 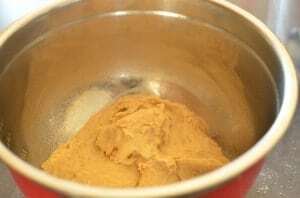 After dough rises, we dump it onto a floured surface and roll out. This is a great job for the kids! Then, we baked them. You can also sprinkle sesame seeds on the buns if you have some! First, we added our veggies to the meat mixture to keep the veggies from falling off our little burgers. 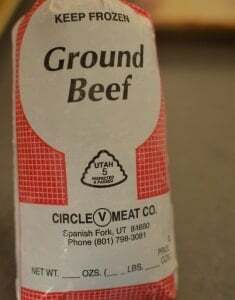 And one of my husbands co-workers gave us some meat to try from his farm. He has some pasture raised, grass eating cows, but apparently, he’s not ready to sell just yet. Maybe in a few months. And that was all! Well, I do realize those are quite a few steps, but they were fun to make, and once in awhile, makes a great, toddler friendly meal. Of course to save loads of time, you could use store bought dinner rolls for your buns! 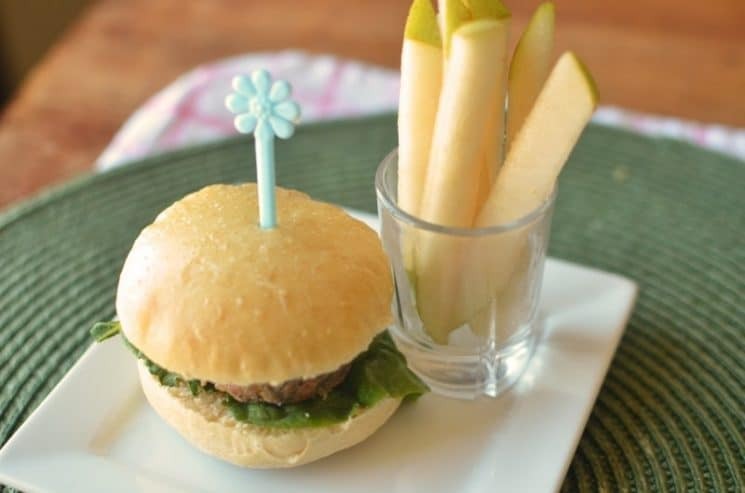 And don’t forget to serve your baby burgers with sliced pears! 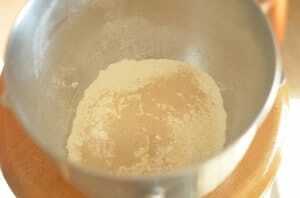 In a large mixing bowl, stir together 2 cups of flour and yeast. 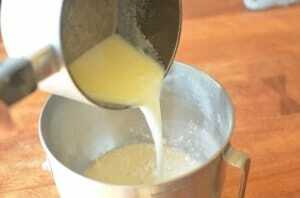 In a small saucepan combine the milk, sugar, butter, and salt. Heat until the butter is just melted, no longer. Add the milk mixture to the flour along with the two beaten eggs. Add the remaining whole wheat flour and knead for about 5-10 minutes. 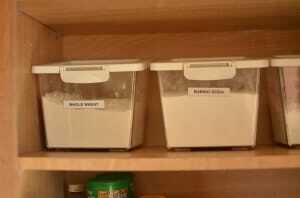 Add more flour if necessary to prevent the dough from sticking to your bowl or work space. Transfer dough to another bowl sprayed with cooking spray, and allow the dough to double in size, or for one hour. 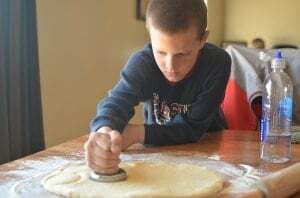 After risen, dump onto floured surface, and roll out with a rolling pin. Cut circles (about 3 inches across) in order to get small hamburger buns. Transfer circles onto a baking sheet. Crack one egg white into a small bowl, and whisk for 1 minute. Using a pastry brush, brush the tops of the circles with egg white. (optional: sprinkle with sesame seeds if you have them). Allow to rest for about 10 minutes on the pan. Bake at 375 for about 12 minutes, or until the tops begin to brown. Remove from oven to cool. Slice lengthwise like a hamburger bun. Makes 18. 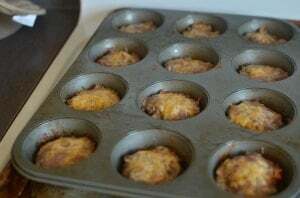 Combine all ingredients and press small amounts into a muffin tin. Sprinkle cheese on top if you like it. Bake at 375 for 15 minutes. Pop out onto paper towels to blot the moisture away before you put the patties on your buns. i like the sliced pears – they really look a bit like french fries in that photo. 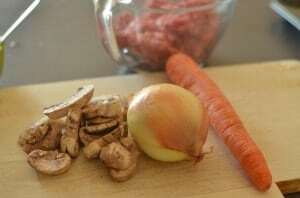 Thanks for the clear recipes plus the logical progression of images; this looks so simple to make! Quick question: would you recommend using a mixture of wholewheat and all-purpose flour to make the bun more palatable? Yes the sliced pears looked like french fries! Its appealing and cute! 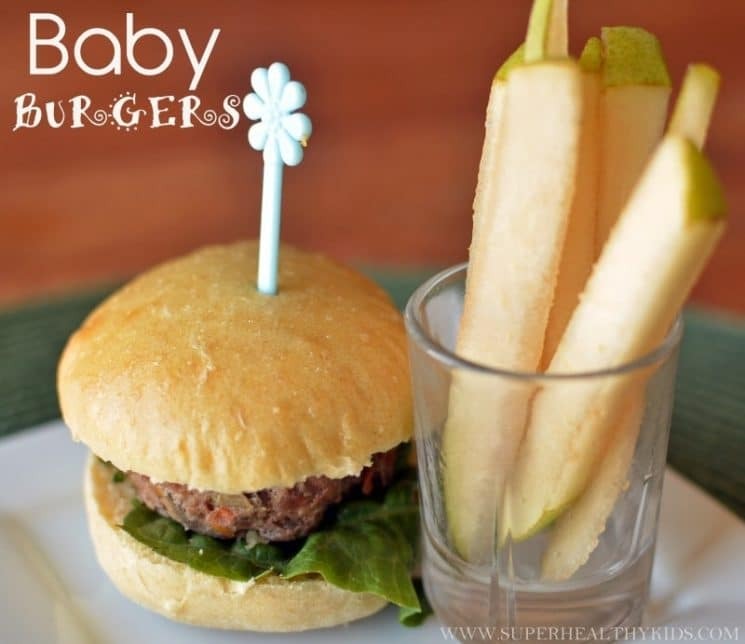 Surely every kid would love to get their hands on these baby burgers. Alana- You could definitely do half whole wheat and half flour for sure! mail or wire transfer as their payment approaches. With the introduction of this kind of chat room, more and more people are enjoying and gaining more benefits from dating websites. I love the idea of these burgers! What kind of seasoned salt do you use? (And what could be a substitute if I don’t have it.) Thx. I used Lawry’s Seasoned Salt- but just salt and pepper would work great! Made These For My Family And Myself..My Boys And Myself Loved Them Even My Husband Did Ty For The Great Recipe! !…This Is N’t Just For Toddlers. My Kids Are 9 And 15 I’m 32 And My Hubby Is 35. We Enjoyed Every Lil Yummy Bit!!! Do i have to add sugar to the buns? 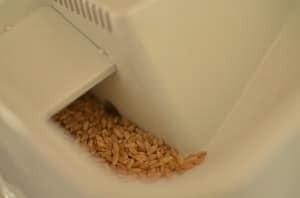 Sugar activates the yeast. You can try it without, but generally there is some sort of sugar to help bread rise. oh ok 🙂 thank you, im a beginner in baking.. I was cu?ious if you ever cons?dered c?anging the structure of you? webs?te? Its very well writte? ; I love wh?t youve got to say. Maybe you co?ld s?ace it out better? 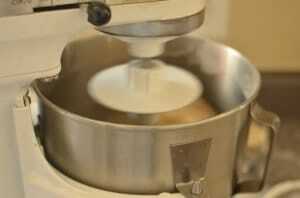 May i know the exact measurements for 2 cups of flour? May i knw what is the actual measurements when you say “cup”? Yes, you can just leave the mushrooms out.. It should be fine! 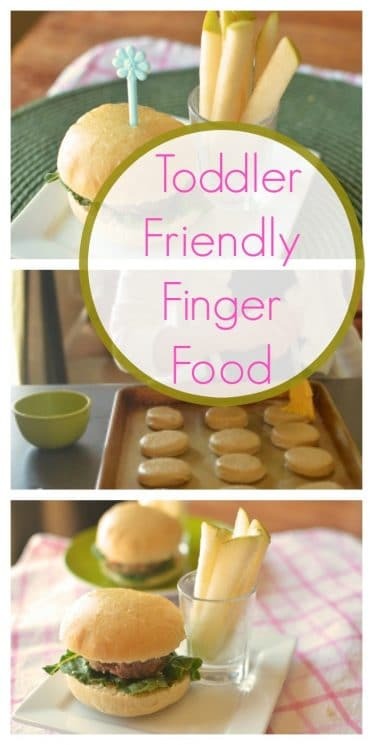 Thank you so very much for great toddler foods that are appealing and use whole foods. Without being offensive to you may I suggest recommending using a very light coating of oil in place of using a store bought cooking spray which some people may have? I have found a couple misters that you pump after adding oil of your choice for that type of ease. Again, thank you, love your recipes. These look great. Can I freeze some of the patties? Thanks. Yes Shannon! You can freeze them. My kids loved it especially the buns.. Thank you for the recipe!